Filiform needles: stainless steel and gold single-use needles are used during treatments. Moxibustion (Moxa): A technique that has been used throughout Asia for thousands of years that involves the burning of the herb mugwort, or artemesia vulgaris, to strengthen the blood, stimulate the flow of qi, and maintain general health. The patient will experience a pleasant heating sensation that penetrates deep into the skin, but should not experience any pain or burning sensations. Press-balls: A tiny silver or gold ball that is attached to a clear or tan circular sticker and placed on auricular (ear) acu- points. Patients are often sent home with press-balls on the ears to stimulate ear acu-points and prolong the effects of a treatment after a treatment has finished. E-stim machine: An Electro Stimulation unit is used during electro-acupuncture. This technique involves a small electric current passing between pairs of acupuncture needles. It can be extremely helpful for musculo-skeletal injuries and the treatment of pain. Magnets: Therapeutic magnets measure anywhere from 200 to 10,000 gauss, but the most commonly used measure 400 to 800 gauss. By using the North and South sides of the magnets along acupuncture channels as a take home method or non-insertive method during treatment, acupuncture points can be stimulated and many musculo-skeletal issues can be resolved. Intradermals and Presstacks: Intradermals are tiny sterile stainless steel needles that are inserted very superficially, just under the skin, at an oblique angle into the skin. Tape is positioned below the needle head to protect the skin from irritation and over the needle head to hold it in place. Press tacks are tiny millimeter sized needles that are inserted perpendicularly into the skin. The head of the needle is a flat ‘O’ shape with a piece of tape over the needle head holding it in place. Both are used on acupuncture points along the body as a take-home therapy to continue the treatment by stimulating the points after you leave the clinic. Essential Oils: Essential oils have been used medicinally in history and are extracted from different raw plant materials. Each oil holds its own medicinal properties and can be incorporated into acupuncture treatments. 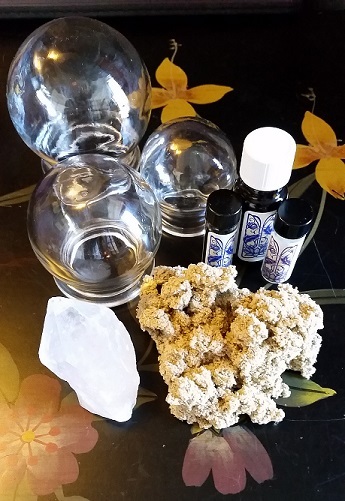 Different uses of essential oils include inhalation methods, diffusers, nebulizers, topical applications on specific acupuncture points, foot baths or massaged into the skin. Cupping: a therapy in which glass or plastic cups are applied to the skin along the meridians of the body (usually the back and neck), creating suction as a way of stimulating the flow of energy. Blood and Qi stagnate in the body causing pain and by using cupping techniques we can loosen the muscles and open up the area allowing the qi and blood to flow more smoothly through the meridians and eliminating pain. Gua Sha: A technique somewhat like cupping where an oil medium is applied to tight muscles or areas of pain and a gua sha spoon is used to scrape along the muscles relieving pain and promoting blood flow through the area. Hiroshi 1000: The Hiroshi 1000 is a tool used during Divergent channel treatments. This style of treatment is performed by measuring the frequencies at Jing Well points on your toes and fingers (this is painless) and applying the readings to a chart, allowing your body to chose which treatment is best suited at that point in time. This type of treatment is best applied to deep rooted issues such as arthritis and lyme disease.